Disclaimer: Regulations on this page are provided for educational purposes only. Each office must verify their required testing frequency. Contact your State dept. of health or equivalent agency for current regulations. This map shows only state level regulations. Many municipalities have additional regulations which may be more strict and/or require more frequent than those referenced here. "Sterilizer efficacy testing - Each holder of a license to operate a body art facility shall demonstrate that the sterilizer used is capable of attaining sterilization by conducting monthly spore destruction tests. These tests shall be verified through an independent laboratory. The license shall not be issued or renewed until documentation of the sterilizer's ability to destroy spores is determined by the Department." "The owner or operator shall demonstrate that a sterilizer used in the school or shop is capable of attaining sterilization through a spore destruction test performed every 30 days. 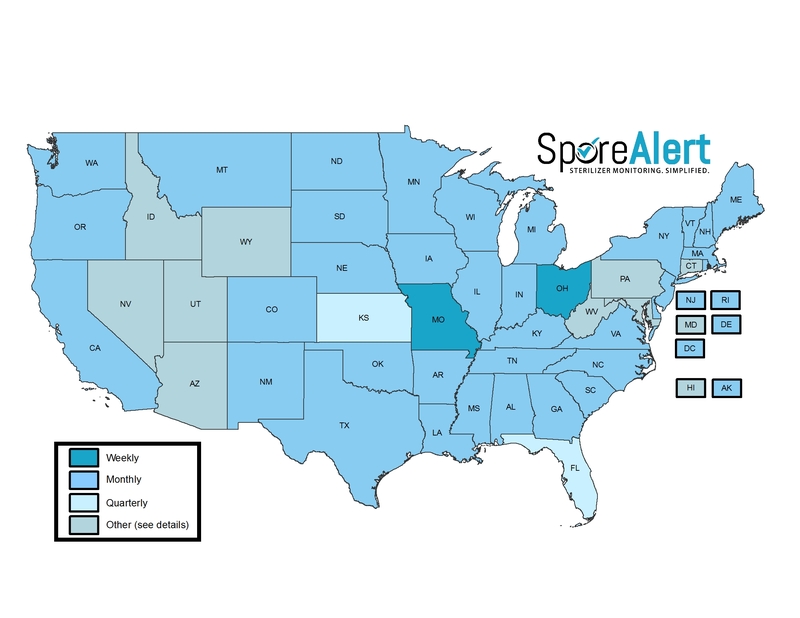 These spore destruction tests must (1) be conducted using a commercially prepared biological sterilization process indicator to culture specifically for Bacillus stearothermophilus for steam sterilizers or Bacillus subtilis for dry heat sterilizers." Note from Woodhouse Laboratories: Our test strips are inoculated with Geobacillus stearothermophilus and Bacillus atrophaeus. These are alternative names for Bacillus stearothermophilus and Bacillus subtilis but are the exact same bacterial strains and meet the all state of Alaska requirements. While there is no state level regulation, regular testing is required in certain cities and counties. Consult your city and county government for your regulations. "A monthly sterilization cycle shall be completed with use of a biological monitoring system (commercial preparation of spores) to assure all microorganisms have been destroyed and sterilization achieved." "Sterilization equipment shall be tested using a commercial biological indicator monitoring system after the initial installation, after any major repair, and at least once per month. The expiration date of the monitor shall be checked prior to each use." "1. Sterilizer monitoring shall be performed at least monthly (unless more frequent monitoring is specified by the manufacturer) by using a commercial biological monitoring (spore) system. 2. All biological indicators shall be analyzed by a laboratory independent from the establishment. 3. Biological indicator test results shall be maintained on the premises for a minimum of three (3) years and must be available for inspection at all times"
"5.5.4 Each holder of a permit to operate a body art establishment shall demonstrate that the sterilizer used is capable of attaining sterilization by spore destruction tests every 30 days. These tests shall be verified through an independent laboratory. The permit shall not be issued or renewed until documentation of the sterilizer's ability to destroy spores is received by the Division. These test records shall be retained by the operator for a period of three (3) years and made available to the Division upon request. If the Division determines that the establishment was open when a current sterile spore destruction test was not available, then an administrative penalty of $100 each day that the establishment was open may be assessed." Testing is required at least monthly. (d) At a minimum in compliance with the manufacturer’s recommendation." Testing is required at least quarterly. (a) A chemical indicator strip placed inside one packet in each load to monitor the sterilization procedure. The strip must indicate exposure to steam and the autoclave operating temperature. (b) Testing with spore strips at a minimum frequency of every 40 hours of operation of the autoclave, but not less than on a quarterly basis." "An independent commercial testing laboratory contracted by the operator/ body artist or both shall perform biological spore testing of the autoclave at minimum monthly, unless the manufacturer specifies more frequent monitoring, or after forty (40) hours of usage, whichever comes first. A provision shall be included in the contract between the operator/body artist or both with the commercial testing laboratory requiring the commercial testing facility to notify the department of any failure of the autoclave to eradicate all living organisms, including spores. The biological spore testing results must be kept at location for a minimum of two years." 10) Upon notification of a positive microbiological monitoring report, the sterilizer shall be immediately checked for proper use and function and the operator shall cease use of the sterilizer immediately upon receipt of the positive report. Three consecutive negative biological tests must be achieved before the studio is reopened. The studio shall have the option to obtain a properly functioning sterilizer with a negative biological report in order to remain open. "Each certificate of registration holder shall demonstrate, by monthly spore destruction tests, that the autoclave used is capable of attaining sterilization. These tests shall be verified through an independent laboratory. Test records shall be retained on-site by the operator for a period of three years." "Determination of effective sterility, such as use of a biological indicator, is performed monthly." "22.5(7) Sterilizers shall be monitored monthly for spores of Bacillus subtilis*, and records of results shall be maintained for three years"
*Note from Woodhouse Labs - Our test strips are inoculated with "Bacillus atrophaeus", which is the present-day common name of Bacillus subtilis. Our strips meet this regulation. "a biological monitoring system using commercially prepared spores, to assure that all microorganisms have been destroyed and sterilization has been achieved. This testing shall be performed every three months for tattoo and body piercing facilities." (a) Sterilization equipment shall be tested during the initial installation, after any major repair, and at least monthly by using a commercial biological monitoring system; and (b) Biological indicator test results for each sterilization unit used in the studio shall be kept on site, and made available for inspection at time of inspection. "A biological monitoring system using commercially prepared spores, to assure that all microorganisms have been destroyed and sterilization has been achieved. This testing shall be performed on a monthly basis for tattoo and body piercing facilities." "The autoclave shall be spore tested at least once each month and records shall be maintained and available for inspection for a minimum period of one year. Each package of sterilized instruments shall be monitored for sterilization by the use of chemical/heat sensitive indicators that measure temperature and general functioning of the sterilizing equipment. Permanent records of sterilization shall be maintained and made available for inspection for a period of one year." "Each holder of a permit to operate a body art establishment shall demonstrate that the autoclave used is capable of attaining sterilization by monthly spore destruction tests. These tests shall be verified through an independent laboratory. The permit shall not be issued or renewed until documentation of the autoclave’s ability to destroy spores is received by the Board. These test records shall be retained by the operator for a period of three (3) years and made available to the Board upon request." However, several municipalities require more frequent testing. Contact your city or county governmental agency to determine your specific requirements. "The owner or operator of a body art facility shall demonstrate that the sterilizer used is capable of attaining sterilization by monthly spore detection tests. These tests shall be verified through an independent laboratory. Test records shall be retained by the owner or operator for a period of at least three years and posted in a conspicuous place within the sterilization area." "At least once a month, but not to exceed 30 days between tests, a spore test must be conducted on each sterilizer used to ensure proper functioning. If a positive spore test result is received, the sterilizer at issue may not be used until a negative result is obtained." "Performance of the autoclave shall checked once per month using Bacillus Stereothermophilus spore strips or suspensions and results recorded and maintained for a period of three years. If the autoclave fails a performance check, the autoclave must be immediately checked for proper use and function and the spore test repeated. If the spore test remains positive, use of the autoclave shall be discontinued until it is repaired, and a repeat spore test is negative." "Autoclaves shall be spore-tested at least weekly. Spore kill test effectiveness shall be conducted by an independent laboratory. If a positive spore test is received, the practitioner shall immediately cease using the autoclave device and notify the office within forty-eight (48) hours." "Monthly biological monitoring must be conducted on the autoclave using standard spore units that are analyzed by a certified laboratory. The results of the monthly spore test must be posted in a conspicuous place." "Spore destruction tests must be performed to prove that autoclaves are capable of attaining the minimum operating standards. Spore tests must be performed at a minimum of once for each autoclave every 30 days and must be verified through an independent laboratory or tester." device by an independent laboratory or other testing facility. (6) The spore testing of all autoclaves at a minimum of once each month and the maintenance of test records for a minimum of 7 years;"
"All steam sterilizer shall be biologically tested on a monthly basis and following repair or breakdown. The biological indicator test for steam sterilization shall consist of bacillus sterothermophilus spores. These tests shall be verified through and independent laboratory"
*Note from Woodhouse Labs - Our test strips are inoculated with "Geobacillus sterothermophilus", which is the present-day common name of bacillus sterothermophilus. Our test strips meet this regulation. "Each holder of a license to operate a body art establishment shall demonstrate that the sterilizer used is capable of attaining sterilization by monthly spore destruction tests. These tests shall be verified through an independent laboratory. These test records shall be retained by the operator for a period of three years and provided to the board upon request." Testing requirements vary by county and city regulations. "Statewide health regulations for tattooing and body piercing are currently being developed by the New York State Department of Health... Until the new regulations are in place, local regulations, if any, apply. For more information on regulations in your area, contact your county or city health department." "The effectiveness of the autoclave in killing bacterial endospores shall be tested once each month by using an endospore-impregnated strip. Results of this test shall be recorded for review annually by the department." "Each holder of a license to operate a body art establishment shall demonstrate that the sterilizer used is capable of attaining sterilization by monthly spore destruction tests. These tests shall be verified through an independent laboratory. The license shall not be issued or renewed until documentation of the sterilizer’s ability to destroy spores is received by the department. These test records shall be retained by the operator for a period of three years and made available to the department upon request. " "Except as otherwise provided in this paragraph, the rules adopted under division (b) of this section shall require that heat sterilizing devices be tested weekly for proper function, using a biological monitoring system that indicates microorganism kill. The operator of a business that performs tattooing or body piercing procedures shall maintain documentation that these tests have been performed. The documentation shall consist of a log indicating the date on which each test was performed and the name of the person performing the test or a copy of the report of any test conducted by an independent testing entity. The operator shall maintain the documentation for a period of at least two years. If a positive biological spore test is obtained, the operator shall take immediate remedial action to ensure that heat sterilization is being accomplished." "Each operator of a body piercing or tattooing establishment shall demonstrate that the autoclave(s) used is capable of attaining sterilization by monthly spore tests. These tests shall be verified through an independent laboratory. These spore test records shall be retained by the operator for a minimum of three (3) years and made available to the Department upon request." "Use of a biological monitoring system (“spore tests”) must be done at least once a month, verified through an independent laboratory, to assure all microorganisms have been destroyed and sterilization achieved." "Autoclave units shall be checked monthly, using a standard spore test, with results maintained on file for inspection. Autoclave units shall be maintained in accordance with manufacturer’s specifications. Records of said monthly checks shall be maintained for a minimum of two (2) years." "Each tattoo facility must keep a current written log for the previous two years of autoclave use including, but not limited to, the date and time of use and results of sterilization spore test strip tests performed at least monthly." "A tattoo establishment owner or operator shall provide lab result slips that state that each autoclave has been bacteriologically tested monthly with commercially prepared packets of Bacillus stearothermophilus or another Bacillus species and has passed the test. These lab result slips shall be available for inspection and kept for at least one year." "Each sterilization unit used by the studio to sterilize instruments and jewelry must have a spore test performed each calendar month by an approved laboratory, and the test results be made available for inspection." "All steam sterilizers shall be biological spore tested at least monthly... Biological spore tests shall be verified through an independent laboratory... Biological spore test records shall be retained for a period of three years and made available upon request. " "At least once a month, sterilizers must be tested by a biological spore test. In the event of a positive biological spore test, the electrologist or tattoo artist must take immediate action to ensure all conditions of sterilization are met." "Autoclaves shall be spore-tested at least monthly. Spore kill test effectiveness shall be conducted by an independent laboratory."